So, I may have cheated a little bit. I took the pictures for these last weekend, but didn't get around to posting them due to having to read a 80 page essay on dialogical aesthetics. It hurt my brain. I was on a scarf kick for a while because I only get to work on knitting while doing something else at the same time, and they are both easy patterns. 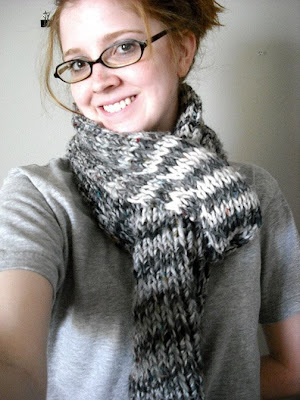 The first is the 'Noro Striped Scarf,' but instead of using Noro, I used bulky weight Tweedle Dee yarn and size 15 ( I think) knitting needles. I really love how soft and warm it turned out. It is knit in 1x1 rib stitch, so it turns out pretty dense, and is completely reversible. Definitely a winner. This second project is a total cheat as well. I have had this finished for about two months, and just now got around posting pics of it. 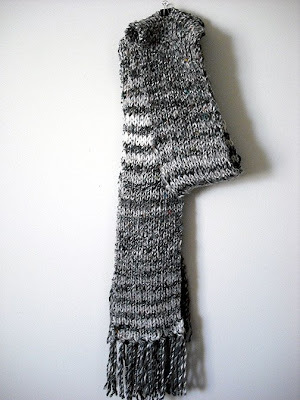 It is the 'Gathered Scarf' and it is knit with Cotton Fine. 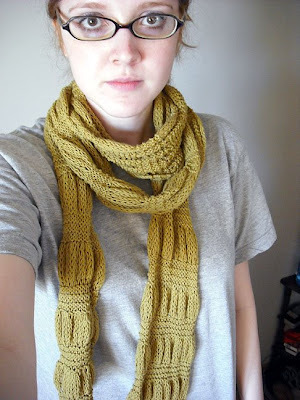 I wear this all of the time, and should really knit one in another color so I can mix it up a little bit. The biggest perk to this scarf is that it washes really well. I just toss it in the machine to wash and dry, and it comes out perfectly. Another win! I love these! I don't usually like the Noro Striped Scarf, but yours turned out great. i hope you get to the city soon. those shows were so great! that second scarf is absolutely gorgeous! i can't learn to knit to save my life. but you do it so beautifully! Mackenzie - thanks! i usually am not a huge fan of it either, but I couldn't resist it in the moda dea yarn!! Ann- thanks as well! I wanted to go into the city this weekend, but instead i got sick. go figure!